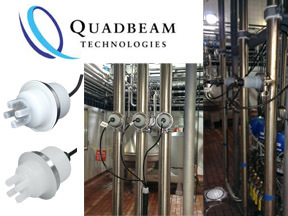 Comments Off on Quadbeam S20 Hygienic Suspended Solids Sensor can help Dairy Plants increase Yields & Efficiency! Locating the exact point of transition between product and water or different products can be challenging with many plants relying solely on time and flow calculations. With the use of a Quadbeam sensor you get to change at the actual point you want to, not a theoretical point. Quadbeam’s four beam ration metric technology self compensates for change caused by contamination or sensor surface or aging of the instrument. Contact us at GWS Supply for more information or help with your applications!